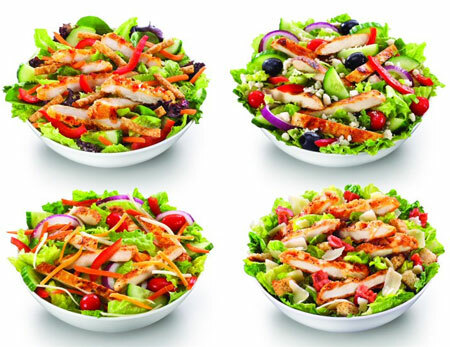 McDonald's has announced 4 new salads for their restaurants in Canada. The Mediterranean Salad: red peppers, grape tomatoes, cucumbers, red onion, crumbled feta cheese, black olives and leafy greens. The Mighty Caesar Salad: parmesan cheese, bacon, croutons and leafy greens with a garlic and parmesan glaze. Spicy Thai Salad: spring mix and leafy greens with red peppers, cucumbers, carrots, and whole wheat crisps with sweet and spicy Thai glaze. Garden Fresh Salad: red onion, cucumber, grape tomatoes, carrots, red peppers, shredded cheddar and Monterey Jack cheeses on leafy greens. The four new entree salads will be well-dressed with Renee's Gourmet salad dressings. Customers can choose from seven dressings, including Asian Sesame Vinaigrette, Mighty Caesar Dressing, Caesar Light Dressing, Mediterranean Greek Vinaigrette, Balsamic Vinaigrette, Ravin' Raspberry Vinaigrette and Buttermilk Ranch Dressing. In the US, McDonald's offers 3 different salads: Southwest Salad, Bacon Ranch Salad, and Caesar Salad. Each are available with or without grilled or crispy chicken. But in the US, we only get the McDonald's slogan in one language. So if you get nothing else from this post, at least learn how to say "I'm lovin' it" in French (see logo above). It's "C'est ça que j'm." I'll even share the pronunciation with you (my wife happens to be a French teacher): Say Sah Kuh Jhem (the "J'm" is hard, it's like "gem" with a 'j'). There, now you can go to the French speaking countries of the world and be a spokesperson for McDonald's. I really love the salads that Mcdonald's has been offering. In the United States they offer a Mexican salad (not sure what it's called) and it is fabulous. However, I find the price is way out of line. If you want people to eat healthy and to pave the way to good nutrition, you need to lower these prices. I NEVER touch any of your other foods and if I go into your stores, I will order a salad but for sure I would be eating them more frequently if they were less money. There is nothing to justify such a ridiculous price. There is another fast food place that offers great salads and their prices are far more reasonable, bigger portions as well.